Stomping to Everything including the kitchen sink! 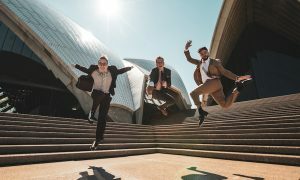 Fresh from performing in the London Olympics closing ceremony the STOMP troupe have returned to Australia with a show that continues their well-oiled routines with a few new numbers. Combining their usual heady mix of slick ensemble choreography, nonstop rhythm and endlessly inventive use of everyday objects as musical instruments, STOMP are able to create a satisfying musical without words, narrative, melody or message. Opening with their signature piece – Brooms – the ensemble brings all their essential elements to the stage – the universal language of rhythm, dance, ‘found sound’ and comedy. Seeming like a soft shoe shuffle for the industrial age, the routine converts the brooms into part willing dance partners and part percussion instruments. The fun in each routine is the combination of effortless multilayered polyrhythm and tightly controlled choreography. Should you focus on individual performers, you will find that they don’t seem to be doing much except walking around the stage, despite the rhythmic energy and complexity telling you otherwise. Like in any magic show, the audience tries to see through the illusion and spot who is playing what, whilst analysing how the movements fit together – is it drumming or is it dancing? Until you realize it is easier just to let go, sit back and allow the rhythm to carry you away and thus enjoy the complete show. While percussion is the central sound of STOMP, the playfulness and willingness to explore everyday sonic possibilities is used to great effect in Frogs where PVC plumbing pipes are used to create a weird, other-worldly sound that is part space age and part sounds-of-the-jungle. Without any clear narrative driving the show, STOMP relies on its playful inventiveness and the pacing of each segment. Each scene ebbs and flows with chaotic numbers such as the kitchen sink followed by segments using zippo lighters that are quiet, understated and almost solely visual in their rhythmic interplay. This astute use of variations in energy and controlled pacing means that there is never a dull moment or a feeling of repetition throughout the show. The show’s setting is in line with STOMP’s aesthetic of industrial chic with a 2- story back drop of hanging objects such as oil drums, plastic containers, and old monster-truck inner tubes that are played throughout the show and act as a visual wall of sound. As the routines unfold in the open space on centre stage, the performers double as stage hands bringing on new settings, clearing them away; literally cleaning up after the previous routine. One can see how the show’s creativity is centered on the idea of a workshop and the constant tinkering and experimenting with rhythmic, visual and dance dimensions. What makes STOMP more than a loose collection of skits is its capacity to create and convey distinctive characters. 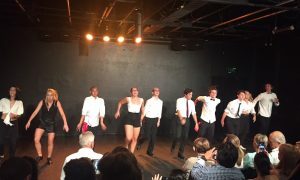 Each of the eight performers has a distinctive character that engages the audience and ensures the show’s internal dynamic. 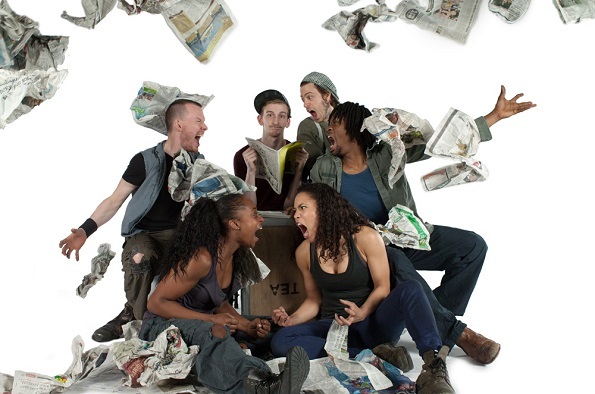 The dance style of STOMP is about musicality and character. While the rhythm may be universal, each performer has a unique body type and individual way of moving. The show celebrates this notion that dance is more about the extension of character rather than solely an acquisition of a skill. Showing its roots in the Edinburgh Festival Fringe, the underlying skill that ties each segment together is comic timing. From the audience participation clapping and stomping to the Frogs segment; to the shopping trolley marching band, to the closing encore, STOMP demonstrates its roots in street theatre and the understanding that the quickest way to engage an audience is to make them laugh. So while STOMP ’13 might be “better than ever” it still relies on its tried and tested elements of funny inventive ensemble work. While the creators are happy to avoid any underlying message in their show, one message comes through loud and clear – humour, creativity, music and dance can be found using nothing more than what is available in the everyday.